In every marriage, conflict is inevitable because every marriage involves two very different and broken people. One of the keys to a great marriage is learning to do conflict well. Earlier this week, Brian wrote 6 keys to fighting with your wife. He promised you my response on Wednesday. We may or may not have had a small disagreement on Wednesday that slowed me down from posting. 🙂 But here is my take. 1. Stop trying to win. 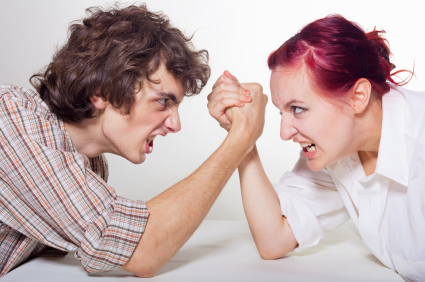 A marriage conflict is not a boxing match with one winner. Trying to win a fight is not the goal. If your goal is to win the argument, you will both loose. Your goal in a conflict is to understand your husband and to be understood by him. At the end of a successful argument you should understand and sympathize with his point, feel more understood by him, and still feel loved. Look for win/win, rather than win/lose. There are things that you can say in an argument that will create lasting relational damage. Don’t go down that road. Slow down before you fire off angry words. Thinking before you speak will radically change the way you fight. In every conflict, Be careful both with what you say and how you say it. My natural tendency in a conflict is not to out-argue Brian but to take control by shutting down. I did this a lot early on in our marriage. I didn’t want him to win; I couldn’t figure out how to make him understand; and I didn’t want to put in the time and energy in order to work out the issue. Quitting in an argument is not helpful in resolving conflict. There are times when a time out is in order in order to reduce emotion or calm down, but shutting down as a way to win is not the way to work through an issue. 4. Don’t walk out of the room. Dramatic exits only work on TV. Sit down, make eye contact, speak calmly and work on listening and understanding. Decide together if you want to take a break, and then come back to the discussion at a later time. But, again. Don’t quit. 5. Don’t repeat unhealthy family of origin habits. In a marriage you are creating a new family environment. You are not enslaved to repeat the conflict patterns that you saw (and hated) in your family of origin. Unless you are aware of this and make a conscious effort to overcome these patterns you are prone to repeat them. It doesn’t take work to fall into patterns you grew up with. It does take work to change them. Create something new. Identify those bad habits. Do it differently. Do it better. If you have other suggestions to share then please comment and add your insight! Chandra Howard has been married to Brian for 19 years and is the mom of four kids (14,12,10,8). She spends her time doing school drop offs and pickups, working in Context Coaching, and coaching women who are looking to grow.